Alaska might seem to be the last place on Earth where solar power makes sense, but guess again. The state’s oil-based economy has not been kind to the many Alaskans living in the innards of the state. Diesel fuel comes at a high cost for off-road villages that rely on aircraft, boats, and snow machines for transportation. Solar beats diesel on cost, creates new local jobs, and helps to level the socio-economic playing field. If that seems a bit Green New Deal-ish, it is. 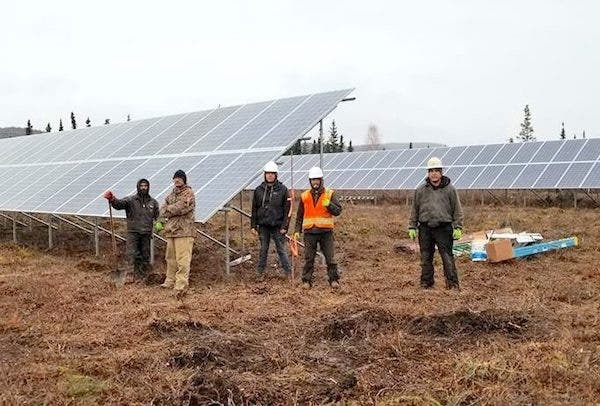 Earlier this year CleanTechnica took note of a new PV project in the remote village of Hughes, developed by the local solar company Alaska Native Renewable Industries. ANRI is a newcomer on the solar scene and it is not letting any grass grow beneath its feet. The company began life in 2017 as a general contractor with a focus on solar power in rural locations, using local labor whenever possible. As a companion specialty, the company has a series of community-wide LED lighting retrofits under its belt, too. With a kickstart from its renewable energy and energy efficiency business, ANRI plans to expand into other construction areas this year, including residential construction. CleanTechnica asked ANRI founder and CEO Edwin Bifelt to follow up with some more details by email. He sure had a lot to say about the advantages of solar over diesel, and the potential for Alaskan solar know-how to play a lead role in the global solar power market. Following are his answers to our questions (condensed for flow). “As a life long resident of Alaska (born and raised in Huslia, a small Athabascan community of 350; in addition to attending college and work in Fairbanks, AK) I very much believe that increasing sustainability and self-sufficiency for rural villages is critical. A big part of achieving this is lowering the costs of electricity in the 200+ micro grid utilities that are scattered throughout the 49th state. Currently rural villages see kWh costs ranging from $0.20 – $0.60 – which is well above the national average. This also takes into account the state subsidy program known as Power Cost Equalization (PCE) which subsidizes approximately 20-50% of the actual cost. This program is facing current attempts to defund it from a Republican led gubernatorial administration. This definitely amplifies the need to diversify our rural micro grids away from diesel powered energy generation and more to renewable sources – Solar PV and Wind being viable options. One advantage Solar PV has over Wind is it’s relatively easy to install and the maintenance costs and requirements are much lower. “I’ve recently had the opportunity to join the Board of Directors of AKSEIA [ed. note: that’s the Alaska Solar Energy Industry Association, which launched in October 2018], so I am very excited about being able to collaborate with other like minded folks in growing the solar industry in Alaska. We are in the process of getting our 501c6 designation and should have the organization operational in the next few months. The mission of AKSEIA is to build a strong solar energy industry in Alaska! Represent any organization that promotes, manufacturers, builds, operates or supports the expansion of solar energy in Alaska. Conduct and support education about solar energy. Disseminate and promote industry best-practices. Require members to adhere to ethical business practices. Remove market barriers to solar energy adoption. “Rural Alaska is such a huge area that every construction project needs to be looked at on a case by case basis. Each community and region (and sub-region) have their own transportation costs/logistical needs to figuring out shipping costs and best practice method (river barge is usually always cheapest, but air freight shipping may be your only option). One of the challenges we had in Hughes, and this can be said for a lot of rural Alaska, is we encountered permafrost when drilling our helical piles to the 8′ depth. This significantly increased the time we spent drilling each hole with the auger bit (we used a bobcat skid steer with a drilling attachment) from approximately 6 minutes to auger each hole to 30 minutes. Weather will also play a big factor in any construction project, so planning is necessary to have contingency plans in case you need to make real-time changes. In all the projects I’ve worked on I’ve used locally hired labor from within the community, so I think we definitely have some good hard working and competent folks in each of our communities. But you will still need licensed electrical administrator to commission projects so it’s necessary to have your operating model in place to sub this out. Got all that? Bifelt’s experience indicates that solar power can take a significant bite out of the diesel fuel cake in cold-weather environments. Antarctica is another region where solar energy is beginning to kill off diesel. Come to think of it, the Energy Department cites Germany’s solar leadership as a reference point for solar potential in Alaska, so there’s that. The emergence of economically viable energy storage adds another weight to the solar end of the scale. One new development on that score is a concentrating solar contraption integrated with hydrogen production for energy storage. Meanwhile, lessons learned in Alaska have inspired Bifelt to think about ANRI’s future in broader terms. “Hopefully in the next decade ANRI can be a company offering solar pv, energy efficiency and new construction throughout Alaska – and the world,” his email concluded. Bifelt could be on to something. The US Department of Energy already has Alaska on its radar for exporting solar know-how to the rest of the world, with a particular focus on microgrids. If it is ‘Alaska tough’, it might just work for you. Global remote microgrid market is large. Alaska has a complex layer of human institutions, including indigenous cultures and tribal communities, non-profit non-governmental organizations, sophisticated regional native corporations, and other private sector enterprises operating within the context of local, regional, state, and federal government agencies. …Alaska continues to enjoy a vigorous democratic debate over the balance between pursuing development opportunities and protecting local cultures and unique environments. For that matter, the impending closure of the notorious Navajo Generating Station in Arizona has drawn new attention to the need for affordable, sustainable electrification in Native American communities here in the US. Green New Deal look out — here comes Alaska!